MANILA - Parents are advised to have their children vaccinated against measles, as the number of measles cases in the Philippines increased by an alarming 367 percent. 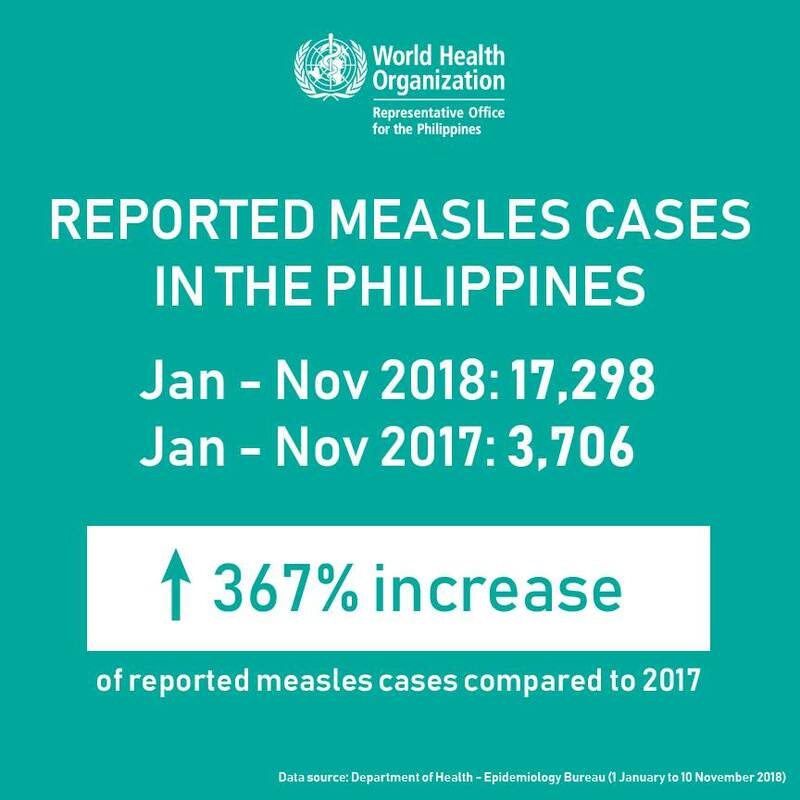 World Health Organization (WHO) said there are 17,298 reported measles cases in the Philippines from January to November 2018 alone, a huge leap from the 3,706 reported measles cases for the same period in 2017.
WHO said unvaccinated young children are at highest risk of measles and its complications, which include severe diarrhea, pneumonia, blindness, and even death. Measles, "caused by a virus in the paramyxovirus family," can be passed through direct contact and through the air, and infects the respiratory tract. WHO said measles' first sign is usually a high fever, "which begins about 10 to 12 days after exposure to the virus, and lasts 4 to 7 days." Other symptoms include "runny nose, a cough, red and watery eyes, and small white spots inside the cheeks can develop in the initial stage," usually followed by rashes on the face and neck. The Department of Health earlier this year urged parents to bring their children to health centers for anti-measles vaccination, which should be administered twice. First shot must be taken when a child is nine months old and to be followed when the child reaches the age of 12 months to 18 months.